René is an avid volunteer in her community: she helps the elderly; helps people seek better jobs for them and their families; helps give mom’s a break; helps care for the afflicted; encourages and offers resources to those who are seeking; and helps other non-profits, other non-profits she has helped include the community center Barns of Rose Hill, Clarke County Memorial VFW Post 9760 and Shenandoah Area on Aging. René is a also teacher of fine arts in nature. She has served as the Vice President of the Virginia Lovers Gourd Society. Her Art in Nature™ classes are a fine art ministry with the Native American Church and are held outdoors at the Sanctuary on the Trail™. Classes are inspired by nature and Great Spirit, God, Heavenly Father, Creator of All. Classes are for ages 1-120. Professional. Amateur. Novice. She also offers private lessons and mentoring in painting, printing, sculpting, carving, photography etc. Chris and René are followers of Jesus Christ as they walk the Red Road in a good way. Scientific Freda Locklear Porter received the 2010 Stellar Award from the U.S. Women’s Chamber of Commerce. Porter was named the 2009 N.C. Minority Business Person of the Year and the 2007 UNCP Business Person of the Year. She was appointed Chairwoman of the North Carolina Advisory Commission on Military Affairs in 2012. 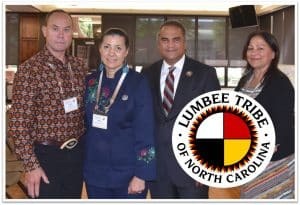 She is a member of the N.C. Defense Business Association board of directors, was a trustee of Smithsonian National Museum of the American Indian, served as the chair of UNCP board of trustees, and founded UNCP’s American Indian Science and Engineering Society.